Heat oil and saute onions and salt over low heat for 15 minutes, stirring regularly until softened and caramelised. Add a little water, if needed. Place puff pastry sheets on top of each other onto a baking tray and score a 1cm border around the edges. Remove base stem of pear and cut vertically into thin slices. 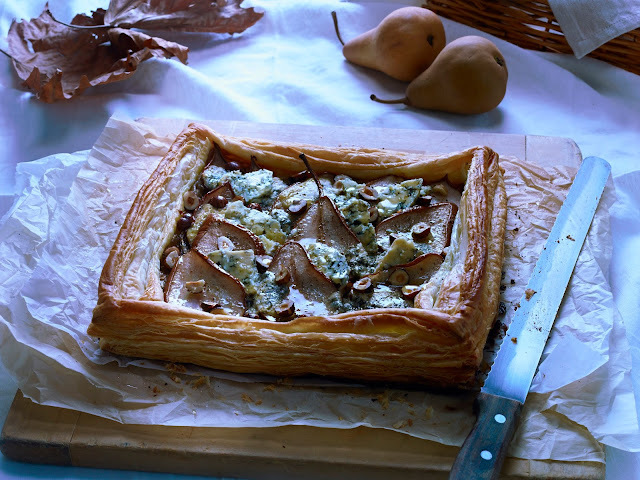 Arrange onions over base of pastry, top with pear slices, blue cheese and hazelnuts. Lightly spray with olive oil and sprinkle with pepper. Bake at 200 degrees Celcius for 25-30 minutes until puffed and golden. Lower to the base of the oven in the last 10-15 minutes of cooking if needed to crisp the underside of the pastry. Serve drizzled with balsamic glaze. Tip: Drizzle with truffle honey instead of balsamic glaze if desired. Note: This recipe was supplied by King Island Dairy Cheese.